God has revealed the truth about Himself and about creation in two ways. He has contained natural revelation inside the man and the environment. An interpersonal dialogue between God and man, allied with supernatural Revelation. It contains two trends: the Holy Bible and Tradition. Sources of the supernatural Revelation were entrusted to the Church`s Teaching and to the pope with the College of Bishops, so that they would guard the deposit of the faith, explained and intelligibly defined for the present generation of the Church`s members. For better understanding of the Divine revelation by the believers, the Church`s Teaching explains the truths of faith in catechisms. This elaboration presents the Mariology questions based on an analysis of texts of the Catechism Of The Council of Trent – issued in 1566 year, after the Tridentine Council – and texts of Catechism Of The Catholic Church issued in 1992, based on the documents of the Second Vatican Council. The Catechism Of The Council of Trent consistsd of four parts. The first explains the articles of faith of the Apostles' Creed. The second discusses the Sacred Sacraments. The third teaches the Ten Commandments of God. The fourth analyses the matter of the Lord`s Prayer. The Catechism Of The Catholic Church has been built up to the scheme of the Catechism Of The Council of Trent. It consists also of four parts: profession of faith, celebration of the Christian mystery, life in Christ and Christian prayer. The thesis present the benchmarking of two elements of a theological antithesis: the biblical image of Eve and of Mary. One can suppose that the contents of the comparing of Eve and Mary, having been placed opposite each other, has been held in the spoken tradition reaching apostolic times. The Church Fathers were already interested in this antithesis in early ages of Christianity. They were: St. Justin, St. Irenaeus, St. Cyril, St. Ephrem, St. Epiphanius, St. Ambrose, St. Jerome and Tertullian. The Eve-Mary antithesis is a theological question developing an understanding of the Divine Revelation in the Christian consciousness of believers. 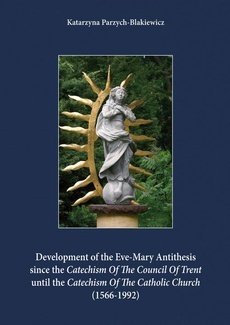 In view of the foregoing, the thesis existing in the theme had been appearing: the development of the Eve-Mary antithesis since the Catechism Of The Council Of Trent until the Catechism Of The Catholic Church (1566-1992). The theology sources of this elaboration are based on the Bible and Tradition, and especially on the Catechism Of The Council of Trent and the Catechism Of The Catholic Church. This dissertation uses an historic-dogmatic method. The historic element expresses an order of the represented sources. At first is the Catechism of 1566, afterwards minor sources and then the Catechism of 1992. The dogmatic element has been defining the essential range of analyzed new-contents. The theme is developed in three parts. The first is about Mary`s preparation to her participation in a general work of salvation. The second shows the Divine motherhood of the Blessed Virgin Mary, and the third, Her spiritual motherhood of the Church.